Park your car at Dalrigh, a short distance before Tyndrum on the A82 (Online multimap). Cross the old bridge over the River Fillan then follow the path up the riverside and cross the railway line via the footbridge. The path continues through some coniferous woodland and crosses a deer fence before turning South West to the ridge. 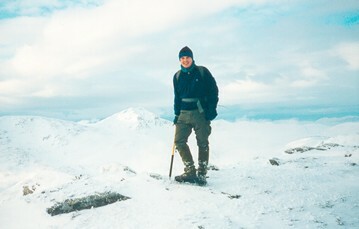 From the ridge head North West to the summit of Beinn Dubhcraig (978m, GR308255). There were cracking views of Ben Lui, Ben Dorain and to the south an awesome view of Ben Lomond. From this point it is normal for hillwalkers to bag the neighbouring munro - Ben Oss (1029m, GR287253) but due to lack of daylight hours we satisfied ourselves with the single summit. 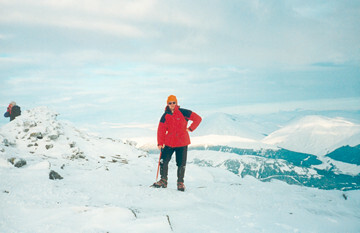 We returned via the Alt Coire Dubhchraig, but the deep windblown snow made the journey tough going in places.